The GDSA's strength lies in its ability to connect not just with governments, but also with civil society and the private sector. It greatly benefits the private sector to focus on pertinent environmental sustainability issues, as these issues have an impact on the long-term profitability and viability of the company. The benefits for a company adopting environmental sustainability as a core philosophy are real, and significant, and resonate across the private sector. Benefits include risk management, client goodwill, employee value and loyalty, brand building and corporate positioning, and the attractiveness of sustainability-focused companies for the investment industry. Private sector sustainability can spur innovation, result in higher efficiency and cost savings, and pre-empt or drive domestic regulations. The reasons why businesses opt to move towards sustainability can differ by company and scale. At the global level, sustainability is the ‘right thing to do’ to mitigate negative health and climate impacts. Conversely, at the local or national level, sustainability often addresses consumer concerns, supply availability, and regulatory compliance, among other issues. Promoting the understanding and uptake of natural capital measurement, valuation and accounting for improved decision-making and management. Promoting environmentally responsible private sector initiatives, focusing particularly on agriculture, fisheries, extractives, and renewable energy. The GDSA Secretariat works towards these outcomes by undertaking a range of activities that include, facilitating dialogue, promoting private sector tools, bringing new projects to the GDSA member countries, among other activities. To undertake this work, the GDSA Secretariat has begun working together with partners – such as Conservation International (CI) – on a series of initiatives at both the national and regional scales. These partners offer technical advice on a range of matters related to the private sector. For example, CI is providing expertise to the GDSA on livestock and oil palm initiatives in southern Africa and Liberia, respectively. At the same time, in 2016, the GDSA Secretariat helped organize and participated in the first symposium on sustainable finance in Botswana, held discussions on sustainable bamboo and rattan with the International Network for Bamboo and Rattan, and organized a delegation of government officials to visit China to discuss issues surrounding renewable energy. 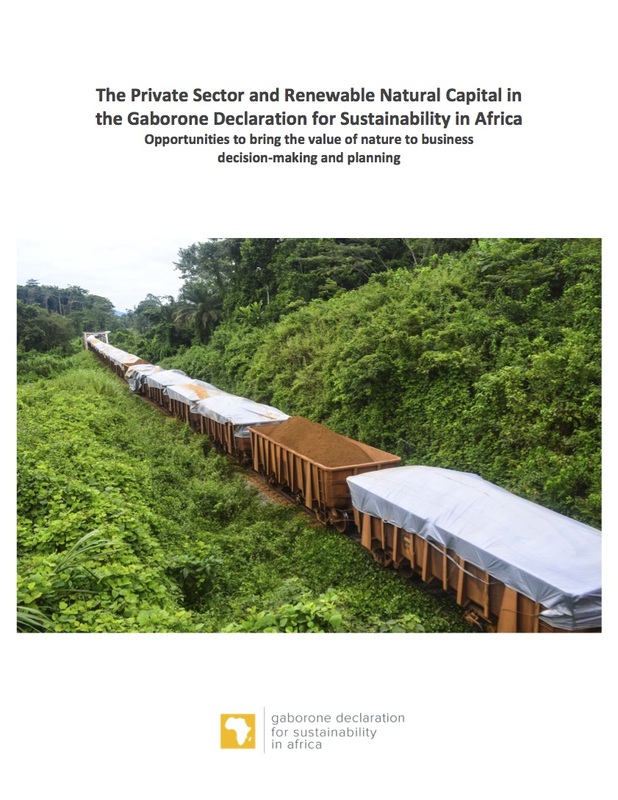 At the regional level, the GDSA Secretariat will aim to use its role as a convener to facilitate knowledge sharing and learning around the mainstreaming of natural capital into the private sector in Africa; often this will build on the outputs of activities undertaken at the national level described, above. This work at the regional level may involve both online and in-person outreach, targeting both the public and the private sector. The GDSA Secretariat works to facilitate dialogue within around the issue of private sector sustainability in Africa. For example the GDSA has facilitated several sustainability initiatives in Botswana (including a sustainable finance conference and a private sector roundtable), and recently hosted a side event on private sector sustainability at the Responsible Business Forum in Johannesburg. The GDSA Secretariat works to connect actors working on private sector sustainability across, and within, GDSA member countries; the aim to share lessons across national boundaries. For example, in 2016, the GDSA facilitated a learning exchange between government officials from Botswana and Liberia and China (focusing on renewable energy). The GDSA works to link the private sector in Africa to existing sustainability tools that they might find useful in their work. For example, the GDSA Secretariat has joined the Natural Capital Coalition, which developed the Natural Capital Protocol. This protocol is a standardized approach to enable all businesses to measure and value their impacts and dependencies on natural capital, and to generate information to guide business decisions. The protocol was developed via an extensive pilot testing process in partnership with over 50 companies from a range of industries, including the Dow Chemical Company, Kering (owner of Gucci, Puma, and Stella McCartney), Hoffman-La Roche, Coca-Cola Company, Hugo Boss, Natura, Nespresso, Nestlé, Olam International, and Shell. Together with Conservation South Africa, the GDSA Secretariat has worked to increase awareness of a range of innovative, sustainable livestock initiatives in the region. To promote this work, the Secretariat attends regional meetings, observes work on-the-ground, and is now working to promote new implementation in member countries.